Have you ever known someone so determined to do what they know they’ve been put on this planet to do that nothing in the world can stop them? That pretty much sums up my friend Delaine. So, there was this one time that Delaine decided to teach herself the language of Hindi. HINDI. Before you read another word, check out this video that Rosetta Stone produced about Delaine, highlighting how she used the program to teach herself Hindi at home. Like a BOSS. Because when I go back to India, I want to pray for those in the villages in their own language. I want them to know that God is calling people all the way over here in the West to leave their homes and love on and care for the tiniest of villages in the East. Our love for India is what brought us together. At the time, I had recently returned from my trip there and Delaine had been longing to go back. She and her family have huge hearts for India and have been called to show God’s love to its people. I know one day, when the time is right, I’ll be writing a blog post about how they moved there to live full-time among Their People. I cannot wait for that day! There’s no need to wait until I get to India to be philanthropic and generous- not when there are felt needs and real wounds right here in my community, my church, and even my Facebook wall. God’s mission isn’t beginning and ending with one trip- but He calls each of us to do what we can to help others wherever.we.are. EXACTLY. Every single one of us has work to do right where we are. And if we don’t know specifically what that work is, then we can just jump in and help someone else do their work until it becomes more clear to us. What we cannot do is sit by idly while the world hurts in so many ways. We can each offer the little tiny talents we have to make a difference. Delaine and I are actually fairly new friends. We just met a few years ago (our first breakfast date was Dec 1, 2012!) but when she describes us kindred spirits, she’s not kidding. Throughout this 31 Days series, I’ve been asking each of My People to answer a few questions to help me guide my writing and potentially remember anecdotes that this old brain has forgotten somehow. Just a few simple, quick answers. But my friend Delaine has done a full-blown interview here, and I am blown away. (She is clearly prone to exaggeration because she says way too many wonderful things about me here.) But it’s incredible to know that things we think might be small gestures toward Our People can mean so much. KC: What do you recall about how/when we first met/ became friends? D: We met at a time where I felt like God was asking me to pursue justice and compassion in India, but I wasn’t seeing any doors opening to do so. I was so frustrated because each time I even mentioned living in India, it was met with surprise and doubt by well-meaning friends and family. I didn’t really feel like I had an ally who had been to India and could give me guidance as to what to expect and how to engage with this beautiful people. Up until the day we met, Jonathan and I had given financially to build a water well in Bangalore, but had no real concrete ties to the land or the people. I remember feeling like I had met a kindred spirit, a “sisters, indeed” sort of feeling! We met through a real life friend, Marla, and she connected us because of our involvement with India. I loved how you encouraged me to move forward with loving people in India, and living a sold-out life in service to others. You were not shy about how painful that can be at times. You understood what it felt like to be overwhelmed with love and overtaken with immobility at the same time. You were real with me. And to find out that you had ALSO been to Bangalore WITH THE SAME MINISTRY that Jonathan and I gave financially to, I was blown away. I immediately felt like God was orchestrating something. You opened up a photo album of your trip to India and I got to see many of the faces that I had only heard about through friends (Brad and Melissa Pauquette). 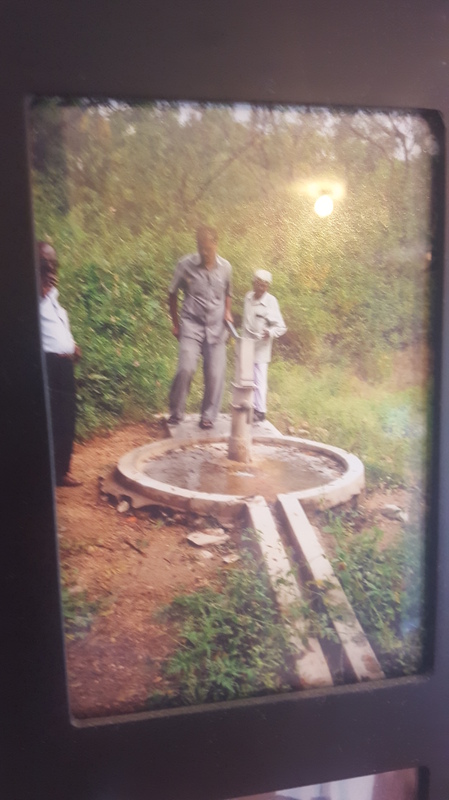 Then, to encourage me and to give me hope that there is a future for me in India, you GAVE me one of the photos of a water well–quite possibly the one that we gave towards building. I remember trying not to cry (in vain) and not scare you away by being an emotional crazy lady that cries over photos of water. But I sensed you understood where I was coming from and that picture hangs on my wall today- it serves as another sort of well… when I’m feeling disconnected, unimportant, too far removed from my beloved Indian family and loved ones, I go back to this picture, and I remember how I may never see my impact, like I may never see the well we built, but the work is still needed and appreciated! I LOVE YOU! KC: When did you first know/think we’d be each other’s People? But first impressions can be that way sometimes. I knew for sure that you were my people, when you followed up with me, checked in on me, sent me advice about fundraising and innovation, and asked me “how can I help you do this?” I remember having tears in my eyes because justice and compassion are overwhelming. They are gut-wrenching disciplines sometimes, where it feels like no single action, no single human can make a big enough dent in the world’s problems to make a difference. But month after month, year after year, I watched you as you made one piece of jewelry at a time, one event at a time- meanwhile encouraging ME to do the same! And I guess, I realized I was your people too when I found myself praying for you and your family, in the secret, quiet times. 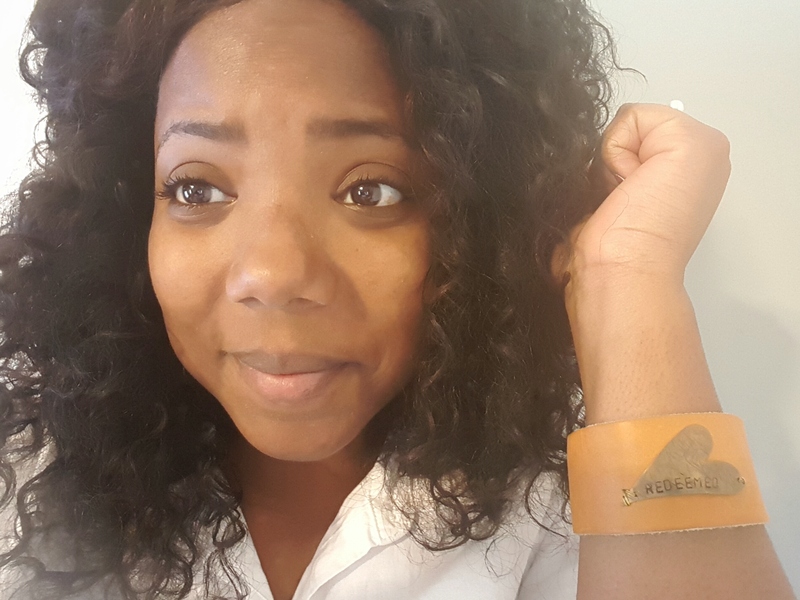 Sometimes, I wear the Redeemed bracelet you made for me on my wrist as I pray for you, and praying for you leads me to pray for the CATCH program and Doma(Freedom a la Cart) and all the other anti-human trafficking advocates. KC: What are the top 3 things you’re passionate about? D: 1. It’s important to me that each person has a chance to reach their biggest potential in life! This comes from my faith in Jesus- He leads me to work toward a more just, more empowered community. Travel!!! One of my favorite things to ask people is where they have been and where they desire to go for vacation. I’m one of the few people I know that gets very excited about being on a plane- I get really chatty and annoying. I want to go to St. Kitts (for the island feel), Belgium (for the chocolate), and Istanbul (for the culture clash)! KC: What are three things you’re not a fan of? 3.Gilmore Girls and other fast-talking, whiny characters, which may include the majority of female characters on television because that’s how The Man writes for women… Forgive me. KC: Would you be willing to share a funny quirk of yours? When I’m at home on Saturday mornings, I put on Bollywood music on Pandora and sing and choreograph dances… I have about 15 different song routines- it’s helped me learn Hindi, make a fool of myself, and provides great belly laughs for my family. Jonathan thinks I should start a Bollywood dance class for exercise… That’s just what the world needs… a Haitian American woman leading an Indian Bollywood dance class. KC: Girl, that is exactly what the world needs! KC: Is there anything else you would like to add about yourself or about our relationship? KC: That’s about the most awesome thing I’ve ever heard, D! Sometime I would love to gather all y’all in my living room with Delaine so she could share her wisdom and delightful personality. So she could tell you more about her heart for justice, racial reconciliation, refugees (isn’t that all of us?) We could talk about the time she came to my class to teach my students about Kwanzaa. 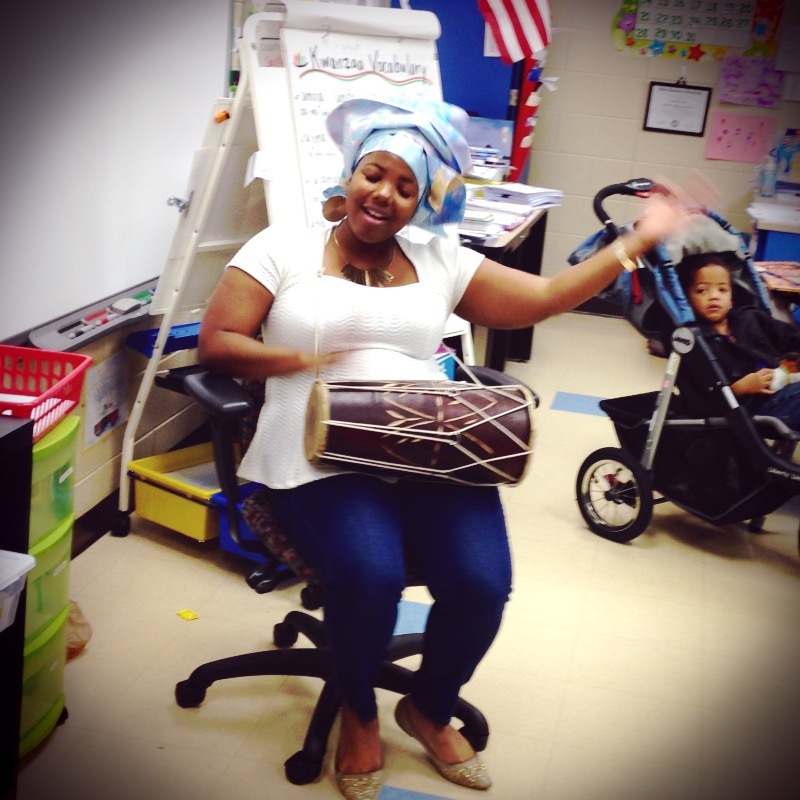 Girl brought her teacher-heart and a drum and sang songs with my class. They were still talking about Mrs. Thomas in May when we left school. Or perhaps she could tell you what inspired her to host women in her own home under the theme of “Arrival Stories.” Women from all over the world sharing about how they arrived in the US. Just sharing, because our stories are important. All of them. Beautiful. Friends, we connect with people all the time over many, many things. You might spark up a conversation with the dry cleaner about your favorite band or brand of coffee. But when you keep in touch, encourage each other’s dreams, and help each other grow in an understanding of how every person on this planet matters, then you know for sure you’ve found another one of Your People. Thank you for your kind words, Delaine! I love you! Enjoy Hawaii! !